Rashmi has been working as a maths teacher in Delhi for twenty years. She decided to teach mathematics in a new way, using a blended approach, instead of following the standard textbook method. Apart from covering literacy and numeracy, she includes life skills, entrepreneurial skills and global citizenship in her classes. In 2000 she set up a Mathematics Laboratory in her school that helps students visualise and experiment with mathematical concepts using concrete objects. She supplemented the lab with a blog for students and other teachers, providing over 500 enriching resources, project ideas and more. For making her materials available on the Internet in this way she received awards from two Presidents of India: the National Best e-teacher award from Dr APJ Abdul Kalam in 2007 and the National ICT Award from President Dr Pranab Mukherjee in 2010. To make maths more realistic and teach students entrepreneurial skills, she helped set up a school business, “Udaan Creating Identity”. This project won the Top Global Prize in the School Enterprise Challenge from NGO Teach a Man to Fish. Rashmi shares her methods widely by conducting workshops for teachers and university students, advising organisations that develop teaching materials, and building an international network of maths educators. 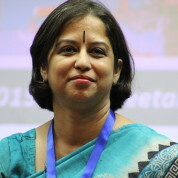 Rashmi is a Google Certified teacher/innovator, won Pearson’s Teaching Excellence in Mathematics award 2015, AIRMC National Best Mathematics teacher 2010, Face to Faith Gold award 2014 and Outstanding award 2015. Join the #TeachersMatter movement by sharing Rashmi Kathuria’s update.